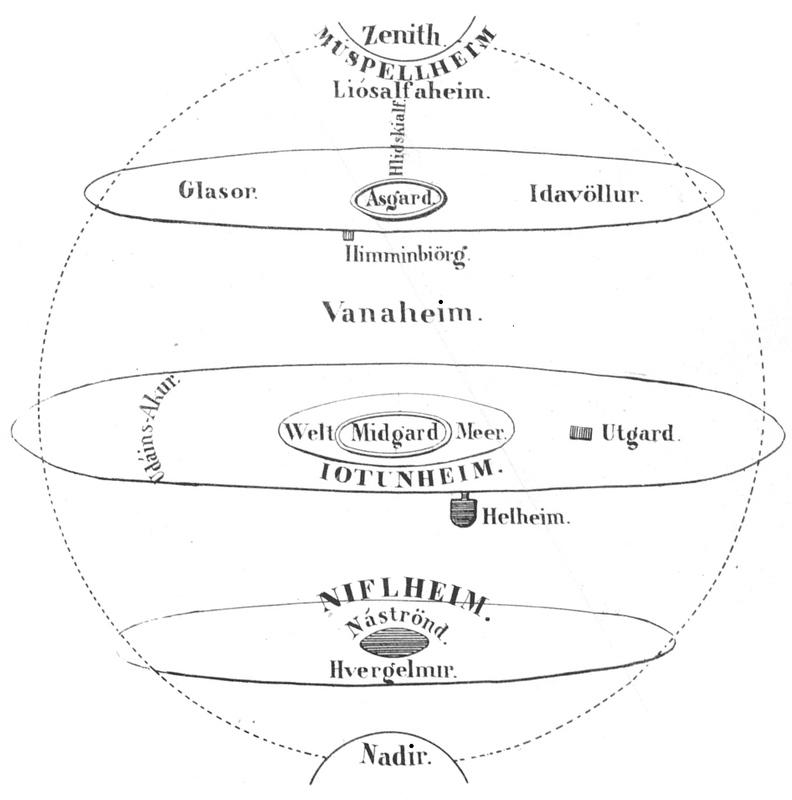 Midgard (Old Norse Miðgarðr, Gothic midjungards, Old English middangeard, Old Saxon middilgard, Old High German mittilgart or mittangard, Proto-Germanic *meðjanagarðaz, “Middle Enclosure”) is one of the Nine Worlds of Norse mythology and an important concept in the pre-Christian worldview of all of the Germanic peoples. It’s the inhabited world, and roughly corresponds to the modern English word and concept of “civilization.” It’s the only one of the Nine Worlds that’s primarily located in the visible world; the others, while they may intersect with the visible world at various points, are first and foremost invisible locations. Midgard is the visible world. Where humans live. In the middle. Between the land of the gods above and the land of the giants and chaos below. The place that should be most familiar to humans. Most of the action in Norse mythology takes place outside Midgard. In fact, the gods seem to have been indifferent to humans. But they did take some steps to protect Midgard. When the gods created the cosmos from the body of the giant Ymir, they placed Ymir’s eyebrows around Midgard to serve as a fence or a wall, to protect it from the chaos that surrounded it. One of Loki’s children, Jormungand, the serpent, lived in the sea that surrounded Midgard, where Odin threw him with the hope that being tossed against the rocks in the sea would kill him. But it didn’t. The serpent grew until it was so large that it circled the earth with enough room left to put its tail in its mouth. While Jormungand surrounded Midgard, it was not for protection. The serpent was a threat to the humans of Midgard as well as the gods. Because Midgard is in the middle. More on that when I get to R is for Ragnarok. Orel, Vladimir. 2003. A Handbook of Germanic Etymology. p. 264. Simek, Rudolf. 1993. Dictionary of Northern Mythology. Translated by Angela Hall. p. 214. Invisible worlds? My, those Norse guys were creative. I love it.